The region’s farmers welcome the approaching end of harvest with sighs of relief for hard-fought yields. 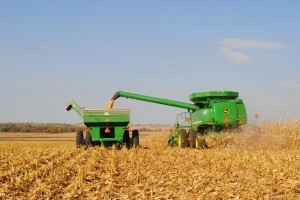 On Monday, the Missouri field office of the U.S. Department of Agriculture’s National Agricultural Statistics Service said the state’s corn and soybean harvests are 94 percent and 86 percent complete, respectively. The NASS earlier said Missouri’s corn production is forecast to reach 419 million bushels, or 69 percent greater than in 2012, which would make it the fourth-highest production in history. Soybeans, meanwhile, are predicted to reach 194 million bushels — 23 percent above last year. The agency said Kansas corn farmers will produce 520 million bushels this year. The total is a 37 percent increase from 2012. The state’s production of soybeans is anticipated to reach 124 million bushels, a growth of 45 percent from last year. Weekend rains have forced area producers like Halls area farmer Jeff Gaskill to delay a wrap-up of field work. His retrieval of corn remains incomplete and may not be finished until after Thanksgiving, given weather predictions. He finished harvesting beans about three weeks ago. But actually it was a lack of rain during parts of the summer that threatened attempts by Mr. Gaskill and his neighbors to raise a better crop of corn and beans. Rain that fell in a very narrow band around Halls didn’t necessarily make it over to Weston, for example. “It was frustrating,” he said. Despite the whims of weather, Mr. Gaskill has managed to produce corn yields in the range of 200 bushels per acre. Other areas are showing yields in the 125-to-145 bushel range. His job also calls for a keen eye on market conditions, with corn landing at about $4 a bushel this year versus last year’s $6 mark. Corn price awareness grew even more as of Friday, when the U.S. Environmental Protection Agency announced plans to lower ethanol levels as a component of the overall fuel supply — which in turn results in lower grain prices. “The price is about two-thirds of what it was. The corn’s much better. Our bean yield was good, but it wasn’t great,” he said. Yields and work for farmers in northern Missouri and the Bethany area — such as Richard Fordyce — have both suffered the most from this season’s drought. One more bout of rain would have made a difference. “We have still quite a ways to go,” he said. “Our beans got planted late, so they matured late” and consequently will be harvested later. “We had good stands. We had good plant health” until the third week of July, he added. He estimated that much of his corn will wind up in the 60-to-70-bushel an acre range. Two of the area’s University of Missouri Extension agents offered their insights into the harvest. Mr. Flanary said not all areas were experiencing the high acreage yields of more than 200 bushels of corn and over 60 bushels of soybeans. “Growers east of Maryville and east of Stewartsville also had their crops impacted by dry weather this year,” he said, yet with reduced yields that are still better than 2012. Bob Kelly of Buchanan County University Extension agreed that yields will average better than last year despite the obstacles.